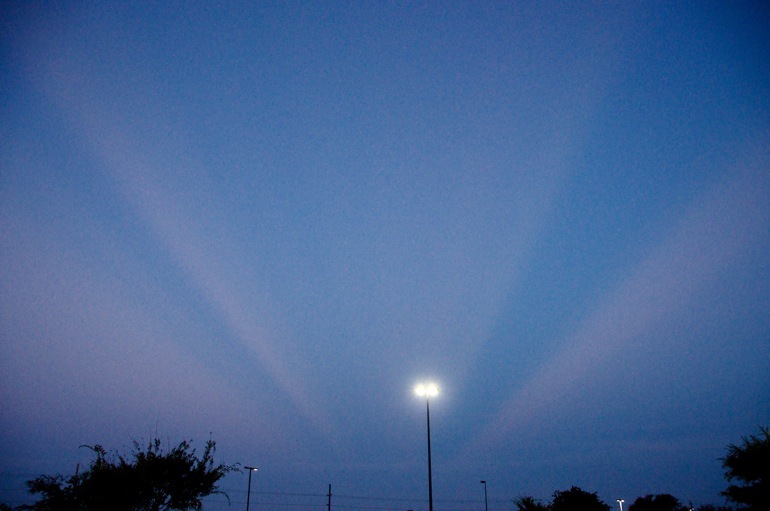 Looking east, opposite the sunset in the west, anticrepuscular rays appear to come out of nowhere. For a better photo and more about the phenomenon, see this NASA page. For some reason, I never pay attention to the sunset when it's actually good. On Tuesday night, I was inside Walmart buying Listerine and bananas when all the action outside was taking place. Unfortunately, I wasn't in a position to get a photo of the setting sun. The buildings were blocking most of it. What I did think was interesting, however, were the anticrepuscular rays, or beams of light that appeared to be emanating from the east, opposite the sunset. I just don't often see this optical illusion, which is caused by our spherical planet, probably because I don't see often sunsets. So, I honestly can't say how often this occurs during Florida sunsets or sunrises. The job could have used a tripod, but I feared persecution from the locals in the Walmart parking lot. Still, I thought I needed to document this. Awesome. I don't think I've ever seen that either.